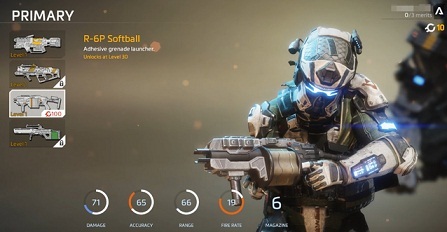 In Titanfall 2, you can choose from a wide arsenal of weapons of any genre. No matter what battlefield you are playing, you cannot always rely on the big titans behind you, but should get to know all the weapons in the game. In the game, there is a so called pilot vs pilot mode, which is particularly demanding on your skills with the "small weapons". But before you can look at each and every weapon, you must first unblock some of them. With these weapons, you get relatively little damage. The R-97 is the best in terms of fire rate. Unfortunately, you will get this SMG as the last weapon in this category, which is why the good values at the beginning of the game cannot matter to you. However, you will already have good alternatives and you can then shoot up to the high level. The assault riffles are more powerful than the SMG's. A true classic in Shooter, which gives you a good combination of damage, fire rate and accuracy. The range at the Assault Riffles in Titanfall 2 is always the same. The difference between the damage and the accuracy is the difference. For this reason, a half-way firing is recommended at any time of the day in narrow buildings, as it will get the optimum from both attributes. Probably the most powerful assault riffle in the category is the G2A5. The number of shotguns is quite small. Only two models are available and you get the second even "relatively" early with Level 19. It makes the SMGs good competition, because their damage is short on short range. At the expense of the fire rate, the shotgun mow down pretty much everything at short range and is particularly suitable for ambushes or surprise surges. These weapons are suitable for the pilot vs pilot mode and the Mastiff even loads automatically. These LMG's also promise good service against Titans since you can deal with the large magazines long and constant damage. As the Titans are hard to miss, you'll get a lot out of your weapon. The X-55 Devotion is especially effective, as it increases its rate of fire when the fire continues. So if you want to put your enemies under pressure for a long time, take this LMG out of the closet. With these heavy weapons, you are a real threat to Titans. The massive impacts do a lot of damage and can be used theoretically against pilots, but in most cases you are just too slow. Just try it, because pilots are not known as "grenade-safe" and for fast titans, we recommend the R-6P Softball as this bullet sticks to its target.